In the 1960's sometimes you just had to fake it. Saturday I went to Cars & Coffee Indy. The usual Corvettes and Mustang’s were there along with the elite Lamborghini and Lotus. Walking through the lot I saw one of those cars that makes you scratch your head and go in for a closer look. It looks authentic 60's design. It slightly resembles a Ford GT40, but not exactly. 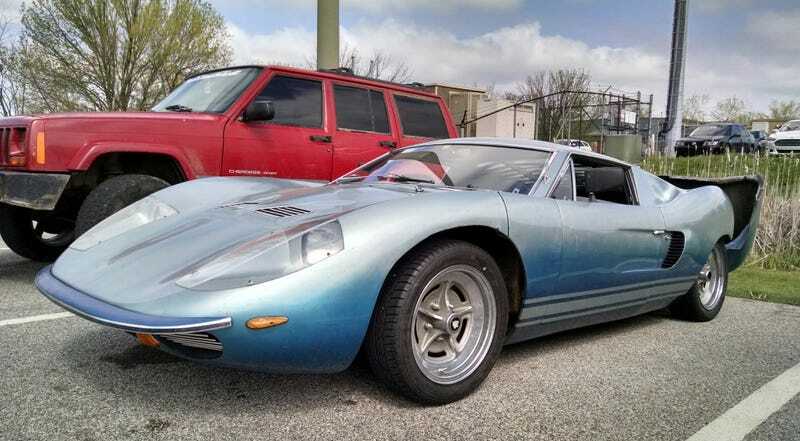 It kind of looks like a Lamborghini Miura, but not really? A Pantera prototype maybe. The closer I get the less I see. No logos, no name, no branding. I’ll have to check the motor that will solve it for sure. Way, way out in the back is... A GM V6. A kit. It’s got to be a kit I tell myself, and as I look to my wife she says “It looks like a death trap.” I couldn’t disagree so I decided it was a Death Trap GT and moved on to other cars. This morning with the help of C&C Indy we figured out it was a FiberFab Avenger GT-12. A kit from around 1967 built on a 1964 VW and powered by a Buick odd fire V6. I’m not certain of the handling characteristics of all this cast iron cantilevered behind the axle but I’d think the relatively narrow tires would make it handle like a snake in the wet. The interior was your basic Spartan deecor and I can’t imagine it’s comfortable in any ride further than your local C&C. The 1960's hold a romantic air over much of America, even those who weren’t around to enjoy them. The glamour and sexuality that oozed out of every advertisement from cigarettes to alcohol extended all the way to kit cars as well. Maybe some of that 60's nostalgia stems from it being a time when; if you couldn’t afford a car that made a woman’s clothes fall off, you could fake it with one of these amazing kits. Today we can only hope 3-D printing brings a renaissance of the kit car and we can soon slam an Aventidorish body on a Miata. In the meantime I’ll be over here looking at the real Lamborghini. OPPO help me track down a logo. It&apos;s Easter. Post some egg shaped transportation devices.